The 2324 is Cartier's Pasha series model with a thrilling combination of diamond and stainless steel. This wristwatch is a gorgeous statement of luxury and sophistication. 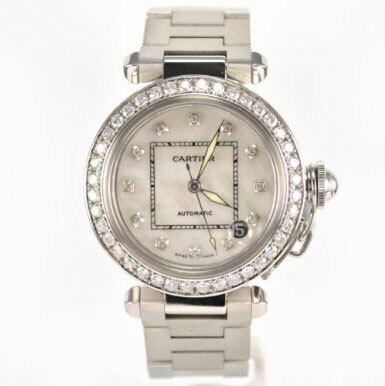 This Swiss made Cartier watch features an elegant scratch-resistant sapphire dial window and a dial color of custom white mother of pearl adorned with 2.58ct diamonds. Its handsomely crafted 10-millimeter case, bezel, and bracelet are featured in a high quality stainless steel. Powered by Automatic movement. Finally, this watch boasts water resistance up to 500 feet. This Cartier Pasha 's original price is $11,100. You can find an original Cartier 2324 Watch at the site(s) listed above. However, we don’t guarantee its availability as being listed here simply means that those site(s) has the item in question by the time we wrote the review.